A desktop computer is a personal computer designed for regular use at a single location on or near a desk or table due to its size and power requirements. The most common configuration has a case that houses the power supply, motherboard (a printed circuit board with a microprocessor as the central processing unit (CPU), memory, bus, and other electronic components), disk storage (usually one or more hard disk drives, solid state drives, optical disc drives, and in early models a floppy disk drive); a keyboard and mouse for input; and a computer monitor, speakers, and, often, a printer for output. The case may be oriented horizontally or vertically and placed either underneath, beside, or on top of a desk. Apple II computer on display at the private Musée Bolo. Prior to the widespread use of microprocessors, a computer that could fit on a desk was considered remarkably small; the type of computers most commonly used were minicomputers, which were themselves desk-sized. Early computers took up the space of a whole room. Minicomputers generally fit into one or a few refrigerator-sized racks. It was not until the 1970s when fully programmable computers appeared that could fit entirely on top of a desk. 1970 saw the introduction of the Datapoint 2200, a "smart" computer terminal complete with keyboard and monitor, was designed to connect with a mainframe computer but that didn't stop owners from using its built in computational abilities as a stand alone desktop computer. The HP 9800 series, which started out as programmable calculators in 1971 but was programmable in BASIC by 1972, used a smaller version of a minicomputer design based on ROM memory and had small one-line LED alphanumeric displays and displayed graphics with a plotter. The Wang 2200 of 1973 had a full-size cathode ray tube (CRT) and cassette tape storage. The IBM 5100 in 1975 had a small CRT display and could be programmed in BASIC and APL. These were generally expensive specialized computers sold for business or scientific uses. 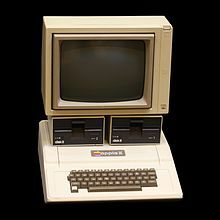 Apple II, TRS-80 and Commodore PET were first generation personal home computers launched in 1977, which were aimed at the consumer market – rather than businessmen or computer hobbyists. Byte magazine referred to these three as the "1977 Trinity" of personal computing. 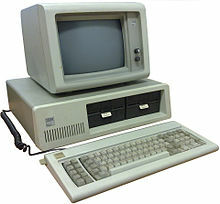 Throughout the 1980s and 1990s, desktop computers became the predominant type, the most popular being the IBM PC and its clones, followed by the Apple Macintosh, with the third-placed Commodore Amiga having some success in the mid-1980s but declining by the early 1990s. Early personal computers, like the original IBM Personal Computer, were enclosed in a "desktop case", horizontally oriented to have the display screen placed on top, thus saving space on the user's actual desk, although these cases had to be sturdy enough to support the weight of CRT displays that were widespread at the time. Over the course of the 1990s, desktop cases gradually became less common than the more-accessible tower cases (Tower was a trademark of NCR created by ad agency Reiser Williams deYong) that may be located on the floor under or beside a desk rather than on a desk. Not only do these tower cases have more room for expansion, they have also freed up desk space for monitors which were becoming larger every year. Desktop cases, particularly the compact form factors, remain popular for corporate computing environments and kiosks. Some computer cases can be interchangeably positioned either horizontally (desktop) or upright (mini-tower). Influential games such as Doom and Quake during the 1990s had pushed gamers and enthusiasts to frequently upgrade to the latest CPUs and graphics cards (3dfx, ATI, and Nvidia) for their desktops (usually a tower case) in order to run these applications, though this has slowed since the late 2000s as the growing popularity of Intel integrated graphics forced game developers to scale back. Creative Technology's Sound Blaster series were a de facto standard for sound cards in desktop PCs during the 1990s until the early 2000s, when they were reduced to a niche product, as OEM desktop PCs came with sound boards integrated directly onto the motherboard. While desktops have long been the most common configuration for PCs, by the mid-2000s the growth shifted from desktops to laptops. Notably, while desktops were mainly produced in the United States, laptops had long been produced by contract manufacturers based in Asia, such as Foxconn. This shift led to the closure of the many desktop assembly plants in the United States by 2010. Another trend around this time was the increasing proportion of inexpensive base-configuration desktops being sold, hurting PC manufacturers such as Dell whose build-to-order customization of desktops relied on upselling added features to buyers. Battery-powered portable computers had just 2% worldwide market share in 1986. However, laptops have become increasingly popular, both for business and personal use. Around 109 million notebook PCs shipped worldwide in 2007, a growth of 33% compared to 2006. In 2008, it was estimated that 145.9 million notebooks were sold, and that the number would grow in 2009 to 177.7 million. The third quarter of 2008 was the first time when worldwide notebook PC shipments exceeded desktops, with 38.6 million units versus 38.5 million units. The sales breakdown of the Apple Macintosh have seen sales of desktop Macs staying mostly constant while being surpassed by that of Mac notebooks whose sales rate has grown considerably; seven out of ten Macs sold were laptops in 2009, a ratio projected to rise to three out of four by 2010. The change in sales of form factors is due to the desktop iMac moving from affordable (iMac G3) to upscale (iMac G4) and subsequent releases are considered premium all-in-ones. By contrast, the MSRP of the MacBook laptop lines have dropped through successive generations such that the MacBook Air and MacBook Pro constitute the lowest price of entry to a Mac, with the exception of the even more inexpensive Mac Mini (albeit without a monitor and keyboard), not surprisingly the MacBooks are the top-selling form factors of the Macintosh platform today. The decades of development means that most people already own desktop computers that meet their needs and have no need of buying a new one merely to keep pace with advancing technology. Notably the successive release of new versions of Windows (Windows 95, 98, XP, Vista, 7, 8, 10 and so on) had been drivers for the replacement of PCs in the 1990s, but this slowed down in the 2000s due to the poor reception of Windows Vista over Windows XP. Recently, some analysts have suggested that Windows 8 has actually hurt sales of PCs in 2012, as businesses have decided to stick with Windows 7 rather than upgrade. Some suggested that Microsoft has acknowledged "implicitly ringing the desktop PC death knell" as Windows 8 offers little upgrade in desktop PC functionality over Windows 7; instead, Windows 8's innovations are mostly on the mobile side. The post-PC trend has seen a decline in the sales of desktop and laptop PCs. The decline has been attributed to increased power and applications of alternative computing devices, namely smartphones and tablet computers. Although most people exclusively use their smartphones and tablets for more basic tasks such as social media and casual gaming, these devices have in many instances replaced a second or third PC in the household that would have performed these tasks, though most families still retain a powerful PC for serious work. Among PC form factors, desktops remain a staple in the enterprise market but have lost popularity among home buyers. PC makers and electronics retailers have responded by investing their engineering and marketing resources towards laptops (initially netbooks in the late 2000s, and then the higher-performance Ultrabooks from 2011 onwards), which manufacturers believe have more potential to revive the PC market than desktops. In April 2017, StatCounter declared a "Milestone in technology history and end of an era" with Android operating system more popular than Windows (the operating system that made desktops dominant over mainframe computers). Windows is still most popular on desktops (and laptops), while smartphones (and tablets) use Android, iOS (Apple products) or Windows 10 Mobile. An all-in-one desktop computer integrates the system's internal components into the same case as the display, thus occupying a smaller footprint (with fewer cables) than desktops that incorporate a tower. The all-in-one form factor was popular during the early 1980s for personal computers intended for professional use such as the Kaypro II, Osborne 1, TRS-80 Model II and Compaq Portable. Many manufacturers of home computers like Commodore and Atari included the computer's motherboard into the same enclosure as the keyboard; these systems were most often connected to a television set for display. Apple has manufactured several popular examples of all-in-one computers, such as the original Macintosh of the mid-1980s and the iMac of the late 1990s and 2000s. Some all-in-one desktops, such as the iMac G4, have used laptop components in order to reduce the size of the system case. By the mid 2000s, many all-in-one designs have used flat panel displays, and later models have incorporated touchscreen displays, allowing them to be used similarly to a mobile tablet. Like most laptops, some all-in-one desktop computers are characterized by an inability to customize or upgrade internal components, as the systems' cases do not provide convenient access to upgradable components, and faults in certain aspects of the hardware may require the entire computer to be replaced, regardless of the health of its remaining components. There have been exceptions to this; the monitor portion of HP's Z1 workstation can be angled flat, and opened like a vehicle hood for access to internal hardware. These desktops are very common and quite budget-friendly compared to others in the market. They are characterized by separate display and processing components. These components are connected to each other by cables or wireless connections. These computers are easy to customize and upgrade as per user requirements. These desktops are connected to home entertainment systems and typically used for amusement purpose. They come with high definition display, video graphics, surround sound and TV tuner systems to compliment typical PC features. These desktops are comparable to Full-Sized desktops, but reduced in physical proportions. Compact desktops can be difficult to customize and upgrade. Desktops have an advantage over laptops in that the spare parts and extensions tend to be standardized, resulting in lower prices and greater availability. For example, the size and mounting of the motherboard is standardized into ATX, microATX, BTX or other form factors. Desktops have several standardized expansion slots, like conventional PCI or PCI express, while laptops only tend to have one mini-PCI slot and one PC Card slot (or ExpressCard slot). Procedures for assembly and disassembly of desktops tend to be simple and standardized as well. This tends not to be the case for laptops, though adding or replacing some parts, like the optical drive, hard disk, or adding an extra memory module is often quite simple. This means that a desktop computer configuration, usually a tower case, can be customized and upgraded to a greater extent than laptops. This customization has kept tower cases popular among gamers and enthusiasts. Another advantage of the desktop is that (apart from environmental concerns) power consumption is not as critical as in laptop computers because the desktop is exclusively powered from the wall socket. Desktop computers also provide more space for cooling fans and vents to dissipate heat, allowing enthusiasts to overclock with less risk. The two large microprocessor manufacturers, Intel and AMD, have developed special CPUs for mobile computers (i.e. laptops) that consume less power and lower heat, but with lower performance levels. Laptop computers, conversely, offer portability that desktop systems (including small form factor and all-in-one desktops) can not due to their compact size and clamshell design. The laptop's all-in-one design provides a built-in keyboard and a pointing device (such as a trackpad) for its user, and can draw on power supplied by a rechargeable battery. Laptops also commonly integrate wireless technologies like WiFi, Bluetooth and 3G, giving them a broader range of options for connecting to the internet, though this trend is changing as newer desktop computers come integrated with one or more of these technologies. A desktop computer needs a UPS to handle electrical disturbances like short interruptions, blackouts and spikes; achieving an on-battery time of more than 20–30 minutes for a desktop PC requires a large and expensive UPS. A laptop with sufficiently charged battery can continue to be used for hours in case of a power outage and is not affected by short power interruptions and blackouts. A desktop computer often has the advantage over a comparable laptop in computational capacity. Overclocking is often more feasible on a desktop than on a laptop; similarly hardware add-ons such as discrete graphics co-processors may only be possible to install in a desktop. ^ "Timeline of Computer History". Computer History Museum. Retrieved May 7, 2014. ^ "Most Important Companies". Byte. September 1995. Archived from the original on 2008-06-18. Retrieved 2008-06-10. ^ "Thirty years of Mac: 1984 - The Macintosh". Apple. Retrieved 8 May 2014. ^ a b c "PC sales are in decline, and in an alarming way for the first time". ExtremeTech. ^ Darlin, Damon (2006-06-15). "Falling Short of A+ - New York Times". The New York Times. Retrieved 2012-10-30. ^ "Michael Dell back as CEO; Rollins resigns - CNET News". CNET. 2007-01-31. Retrieved 2012-10-30. ^ "Lap-top computers gain stature as power grows". Daily News of Los Angeles (CA). 12 April 1987. Retrieved September 30, 2016. ^ a b "The Falling Costs of Mobile Computing". Falling Costs of Mobile Computing Drive Corporate Adoption. Computer Economics, Inc. December 2005. Retrieved September 30, 2016. ^ Randall Stross (18 April 2008). "The PC Doesn't Have to Be an Anchor". New York Times. Retrieved 20 April 2009. ^ "Intel: laptop/desktop crossover coming sooner than expected". The Register, UK. Retrieved 10 October 2008. ^ Charles Jade. "Decline of the Desktop Mac". gigaom.com. ^ a b "Computer Sales in Free Fall". The Wall Street Journal. ^ "Microsoft quietly kills off the desktop PC". ExtremeTech. ^ "Can a $50 mini PC replace your desktop?". Yes, the hardware is technically much slower than anything in a modern Windows desktop, but it didn’t feel that way. Instead, the interface was snappy, Web browsing was smooth, and load times were short. ^ "Android overtakes Windows for first time: "Milestone in technology history and end of an era" as Microsoft no longer owns dominant OS" (Press release). ^ a b "How to Buy an All-in-One PC". PC Magazine. Retrieved 18 October 2015. ^ "Review: Gateway Profile 4 vs. Apple iMac". BetaNews. Retrieved 18 October 2015. ^ Schofield, Jack. "Should I buy an all-in-one PC for my small business?". The Guardian. Retrieved 18 October 2015. ^ "HP Z1 G2 review". PC Magazine. Retrieved 18 October 2015. ^ Cliff, J. "Laptops vs desktops. Personal Computer World". Incisive Media Limited. Retrieved February 7, 2012.